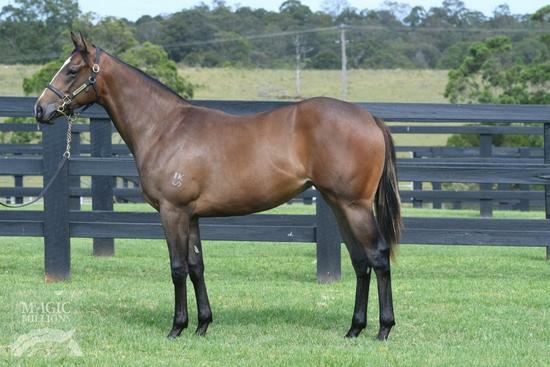 SIZZLING (AUS) (Bay 2009-Stud 2014). 7 wins-5 at 2-from 1000m to 1600m, A$1,332,375, BRC TJ Smith S., Gr.1, Champagne Classic, Gr.2, Sires' Produce S., Gr.2, Queensland Guineas, Gr.2, Gold Edition P., L, GCTC Ken Russell Memorial Classic, L, 2d BRC BJ McLachlan S., Gr.3, Vo Rogue P., Gr.3, BRC Phelan Ready S., L, 3d ATC Expressway S., Gr.2. Out of SP Admirelle. Grandson of SW Laudemio. His oldest progeny are 2YOs. Victory Marvel (g. by I Am Invincible). 5 wins at 1200m, HK$5,655,900, in 2016-17, HKJC Seoul H., Wong Nai Chung H., Arsenal H., American Club Challenge Cup, Oi Man H., 2d HKJC Tai Po H., Lam Tin H., Peel H., 3d HKJC New Lantao Bus H., Tai Kok Tsui H.
Husson's Kiss (f. by Husson). Winner at 1350m in 2016-17, 2d TRC Wolf Blass H., 3d TTC One Thousand Guineas. Amphometer. 2 wins at 1100m, 1400m, TRC Shepperd Brothers Plumbing H., 2d TRC Business East Enterprise H.
Senro Kisaki. 2 wins. See above. Hunter Red. 2 wins at 1600m, 2000m in Aust. Let's Burn a Debt. Winner at 1600m in Aust. Producer. George William (Paco Boy). 4 wins from 7f to 8½f to 2017, Haydock Apollobet Bet on Lotteries H., 2d Ascot Victoria Cup, Newmarket NGK Spark Plugs H., 3d Newbury Dubai Duty Free Cup, L, Haydock Best Odds at 188bet H.
Exotic Girl (Antonius Pius). 6 wins-3 at 2-from 1000m to 1800m, €108,787, Milan Premio ANF, Rome Premio Timboroa, 2d Rome Premio The Elk, Premio Zafonic, 3d Rome Premio Tadolina Memorial Galli Patrizio, L, Milan Criterium Ambrosiano, Rome Premio Jebel Ali Racecourse, Premio Allevamento, Premio Gray Ghost, Premio Osorio, Premio Zafonic, Premio The Minstrel. Habalwatan (In the Wings). 4 wins-3 at 2-from 1m to 1¼m, Newmarket Greene King H., Lingfield HBLB 2YO S., 3d Chester Dee S., Gr.3, Beverley Totesport.com H.
Compton Eclipse. 5 wins from 7f to 8¾f, Newbury Places Trading H., 3d Leopardstown Irish International Proximity H.
Mata Cara. 3 wins. See above. FLAMBEAU (Oasis Dream). 2 wins at 7f, Leicester Leicestershire S., L, 2d Lingfield Chartwell S., Gr.3, 3d Pontefract Flying Fillies' S., L.
ZAHAM (Silver Hawk). 5 wins at 1m, 1¼m, £172,415, Royal Ascot Hampton Court S., L, 2d Ascot Cumberland Lodge S., Gr.3, Goodwood Select S., Gr.3. SPECIAL ENVOY (Stroll). 7 wins from 1m to 9f, US$252,010, to 2017, Laurel Edward Evans S., L, Hansel S., L, 2d Monmouth Cliff Hanger S., Gr.3. DANCERA (Jump Start). 9 wins to 1400m in Argentina and Panama, Panama Clasico Union de Preparadores, L, 2d Panama Clasico Dia de la Madre, L.